By a / September 15, 2007 / . The natural world is a source of endless delight—if you don’t have to go outdoors to enjoy it. Having grown up in rural Canada, I harbour no sentimental feelings toward Mother Nature or her alleged charms. Nature is wet and full of bugs, and any solace or inspiration one might get from it can easily, and more comfortably, be gained from dry, pest-free books or any of Sir David Attenborough’s charming documentaries. 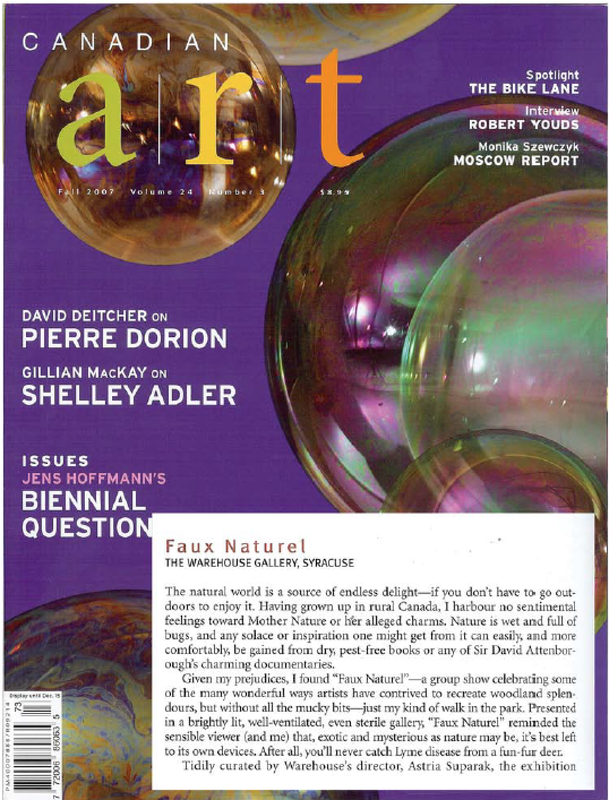 Given my prejudices, I found “Faux Naturel”—a group show celebrating some of the many wonderful ways artists have contrived to recreate woodland splendours, but without all the mucky bits—just my kind of walk in the park. Presented in a brightly lit, well-ventilated, even sterile gallery, “Faux Naturel” reminded the sensible viewer (and me) that, exotic and mysterious as nature may be, it’s best left to its own devices. After all, you’ll never catch Lyme disease from a fun-fur deer. Tidily curated by Warehouse’s director, Astria Suparak, the exhibition sported a neat division between works that strove for broad, dramatic statements about our confused and contradictory relationship to the non-synthesized world and works that offered a more contemplative, even muffled response to nature’s overbearing, symbol-loaded presence. I doubt it’s an accident that the quieter works conveyed a distinctly mossy, somewhat befuddled melancholy. Like the too-brainy-for-their-own-good characters in Paul Bowles’s novels, those aristocrats who drift into jungles or deserts to confront their inner demons only to find (and be driven mad by the discovery) that the trees and dunes have their own problems, these clever artists appeared haunted by their inability to fully connect with the unknowable vegetation. Nature, it appears, is immune to cultural appropriation. For instance, the Toronto artist Annie MacDonell’s lacy, spectral collages depict female forms in danger of melting into the compost, of being shredded by the pretty but menacing cut-and-paste gardens that surround them. MacDonell’s women, little more than white silhouettes and bleached-out assemblies of fashion model curves and postures, are no match for the culled images of sharp petals and blade-like branches. They have been bled to invisibility by all the sharp thorns. In MacDonell’s Eden, the human presence, despite any pretense to the contrary, is as ephemeral and insubstantial as morning fog. No less creepy were the Montrealer Andrea Vander Kooij’s deftly embroidered diagrams of the skeletal formations of birds and squirrels. Jauntily juxtaposed with vintage (and mid-century gaudy) floral bedspreads—the kind your mother ordered from the Sears catalogue in 1974—Vander Kooij’s X-ray takes on familiar park fauna are cheery yet gory reminders that, cute as they may be, animals are just animated meat. These works would be disgusting if they weren’t so beautifully crafted, which is the whole confounding point. 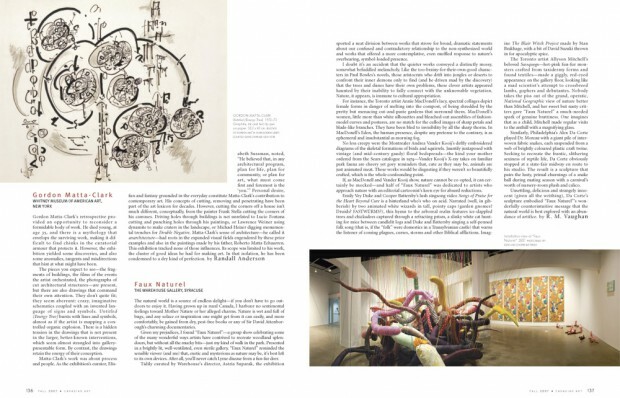 If, as MacDonell and Vander Kooij show, nature cannot be co-opted, it can certainly be mocked—and half of “Faux Naturel” was dedicated to artists who approach nature with an editorial cartoonist’s keen eye for absurd reductions. Emily Vey Duke and Cooper Battersby’s lush singsong video Songs of Praise for the Heart Beyond Cure is a hinterland who’s who on acid. Narrated (well, in gibberish) by two animated white wizards in tall, pointy caps (garden gnomes? Druids? FASTWÜRMS? ), this hymn to the arboreal realm features ice-dappled trees and chickadees captured through a refracting prism, a slinky white cat hunting for mice between candlelit logs and Duke and Battersby singing a self-penned folk song (that is, if the “folk” were domestics in a Transylvanian castle) that warns the listener of coming plagues, curses, storms and other Biblical afflictions. Imagine The Blair Witch Project made by Stan Brakhage, with a bit of David Suzuki thrown in for apocalyptic spice. The Toronto artist Allyson Mitchell’s beloved Sassquogs—hot-pink fun-fur monsters crafted from taxidermy forms and found textiles—made a giggly, red-eyed appearance on the gallery floor, looking like a mad scientist’s attempt to crossbreed lambs, gophers and debutantes. Nobody takes the piss out of the grand, operatic, National Geographic view of nature better than Mitchell, and her sweet but nasty critters gave “Faux Naturel” a much-needed spark of genuine brattiness. One imagines that as a child, Mitchell made regular visits to the anthill with a magnifying glass. Similarly, Philadelphia’s Alex Da Corte played Dr. Moreau with a giant pile of interwoven fabric snakes, each suspended from a web of brightly coloured plastic craft twine. Seeking to recreate the frantic, slithering sexiness of reptile life, Da Corte obviously stopped at a state-fair midway en route to his studio. The result is a sculpture that pairs the lusty, primal churnings of a snake ball during mating season with a carnival’s worth of nursery-room plush and calico. Unsettling, delicious and strangely innocent (given all the writhing), Da Corte’s sculpture embodied Faux Naturel’s wonderfully counterintuitive message that the natural world is best explored with an abundance of artifice.